Brothers Lou and Evan Miller have always had friendly competition in their relationship. They both played football at Columbia and grew up proving feats of strength (like who could do the most tricep dips, earning the esteemed title of Mayor of Dip City). 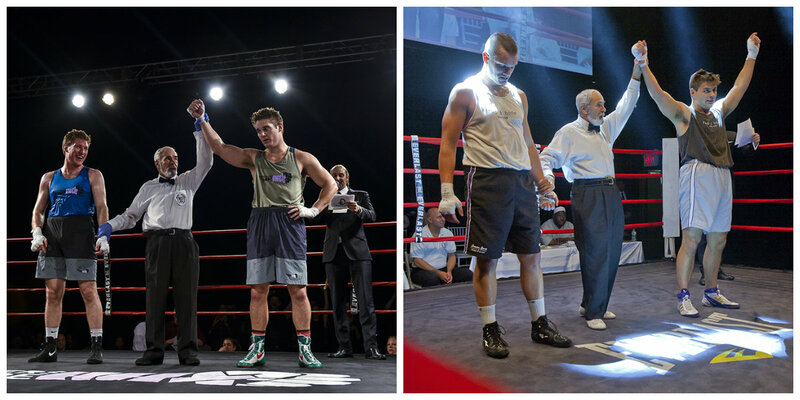 When Lou competed in 2013’s Haymakers for Hope Fight Night in New York City, Evan knew he had to follow suit. Lou, who works in financial services missed competing in college athletics and was inspired to sign up after attending a fight night. The whole Miller family came out for the event (fellow 2013 fans might remember them as one of the loudest boxes in Hammerstein that year), and younger brother Evan, who works in ad sales at Google, got the boxing bug that night. Two years later, he climbed into the ring at Madison Square Garden. Both guys trained at Mendez Boxing Gym, and while they’ve never sparred, there’s a healthy bit of debate as to who would win if they ever went toe to toe. “I would give myself Spence to Garcia odds I would him,” says Evan. Lou politely disagrees. “Evan has better hand eye coordination,” Lou admits, “But I would win because of the brute force.” “That’s assuming you could cut the weight,” Evan laughs.